How do you collect sea turtle poop to better understand their foraging areas so they can be better protected? You build them a custom swimsuit with a built-in poop bag. That is exactly what University of Queensland researchers Owen Coffee and Carmen da Silva did when they were unsuccessful in collecting poop from the endangered loggerhead sea turtles. Coffee constructed the “giant nappy” or baby diaper in American lingo out of used sun shirts (or “rashies” in Australian surf jargon) that he purchased from a local charity shop. Coffee and da Silva proceeded to remove the sleeves on the sun shirts, slit the sides and sewed the bottom in two places, and with the help of some strategically placed velcro and a detachable poop collector, they were in business. 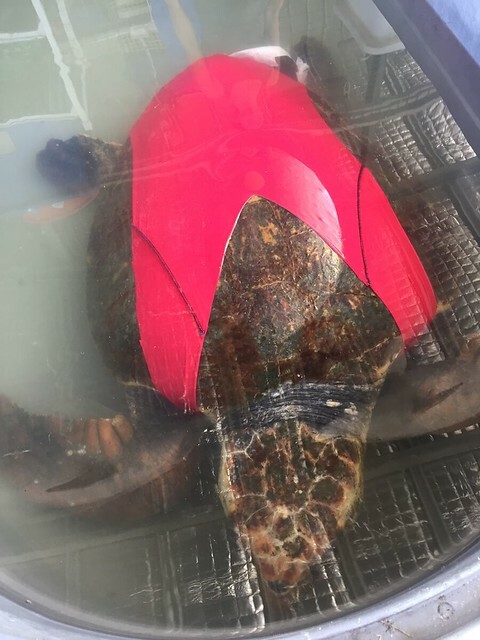 This modified sun shirt helped University of Queensland researchers to collect turtle poop in an effort to better protect them. After the sea turtles did their business, the suits were removed, the poop was collected and the turtles were returned to Australia’s Moreton Bay. That is how Australian scientists collect loggerhead sea turtle poop, all in an effort to better protect the species.